Manitoba began celebrating Queen Elizabeth II’s Diamond Jubilee on Monday, beginning with a flag-raising outside the Manitoba Legislature. Lt.-Gov. Philip Lee and Premier Greg Selinger then both signed a book of celebration, which will be open to the public for three months in the foyer of the Manitoba Legislature. An ice sculpture near the statue of Queen Victoria was later unveiled on the north lawn. An architectural lighting display at the Legislature can be seen each evening from 6 to 10 p.m. until Sunday, February 12. Manitoba will mark Queen Elizabeth II’s Diamond Jubilee along with other provinces during several events planned for today. To begin celebrations, military cadets will raise the Queen’s Canadian flag at the front of the Manitoba Legislature at 7:30 a.m., where it will be flown for one day before being put on display in Government House. At noon, Lt.-Gov. Philip Lee and Premier Greg Selinger will be the first to sign a public book of celebration located in the front foyer of the Legislature. The book will remain open to the public for three months to add their well wishes. A Diamond Jubilee ice sculpture will be unveiled at the Manitoba Legislature located near the statue of Queen Victoria on the north lawn at 5:45 p.m.
At 6 p.m., the Canadian flag will be lowered by cadets, folded and presented to the lieutenant-governor, followed by an architectural lighting display of the Legislature. The display can be seen each evening from 6 to 10 p.m. until Sunday, February 12. Manitoba Lt.-Gov. 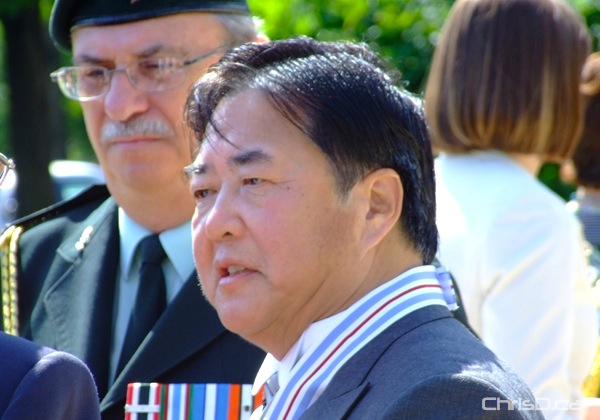 Philip Lee and his wife Anita Lee will host their annual New Year’s levee this afternoon at the Manitoba legislature. From 2:30 p.m. to 4 p.m., the public can take in complimentary sleigh rides around the legislature grounds. Members of the Manitoba Living History Society and the United Empire Loyalists Association will attend the levee in heritage costume. Entertainment will include a traditional Chinese lion dance and performances by Renaissance Voices, the Westwood Community Band and the Winnipeg Police Service Choir. A collection box to accept donations of canned and non-perishable food items for Winnipeg Harvest will be located in the front lobby of the legislature. A New Year’s Day tradition will continue on Saturday as Manitoba Lt.-Gov. Philip Lee and his wife, Anita, host a public levee at the Manitoba legislature. Weather permitting, January 1 will include complimentary sleigh rides around the Legislative Building, and members of the Manitoba Living History Society and the United Empire Loyalists Association will attend in heritage costume. Entertainment will include a traditional Chinese lion dance and performances by fiddler Michael Audette, harpist Janelle Nadeau and the Winnipeg Police Service Choir. Donations of canned and dry food for Winnipeg Harvest will be collected in the front lobby of the legislature. The levee will run from 2:30 p.m. to 4 p.m.
Manitoba’s 24th Lieutenant Governor was installed on Tuesday afternoon at the Manitoba Legislature. Philip Lee takes over from John Harvard, who served for the last five years. Lee says he will use his position in office to raise awareness for those living with visual impairments. He is also the first Chinese-Canadian to hold the prestigious position. The province is getting a new Lieutenant Governor, and his name is Philip S. Lee. Prime Minister Stephen Harper made the announcement Friday morning that Mr. Lee will serve as the next Lieutenant Governor of the Province of Manitoba. Harper said he consulted on the choice of Lee after speaking with Premier Gary Doer and Opposition Leader Hugh McFadyen. “For decades, Mr. Lee has played an integral role in Winnipeg’s cultural community and has been widely recognized for his efforts in promoting a positive cultural awareness among Canadians of all ethnic and cultural backgrounds. As such, he is well prepared to assume this prominent role as the Queen’s representative in our province and will bring an exciting dynamic to this office,” Premier Gary Doer said in a news release Friday afternoon. He was named to the Order of Canada in 1999 and is currently married with three daughters. Lee will replace outgoing Lieutenant Governor John Harvard, as he comes to the end of his five-year term. UPDATE: August 5, 2009 — View a photo gallery from Philip Lee‘s installation as the 24th Lieutenant Governor of Manitoba.